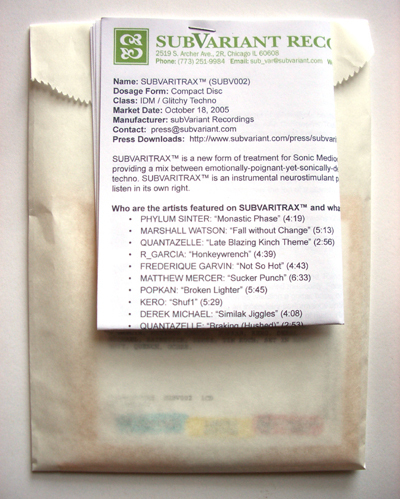 [SUBV002rx, 2005] The prescription version of SUBVARITRAX™ is a new form of treatment for Sonic Mediocrity Overexposure (SMO). SUBVARITRAX™ works by providing a mix between emotionally-poignant-yet-sonically-dense IDM, and scientifically formulated, provocatively glitchy minimal techno. With contributions from Quench (Funckarma), Ochre, Tim Koch, edIT, Kero, Matthew Mercer and others, SUBVARITRAX™ is a new type of neurostimulant proven to help people with SMO as well as being an enjoyable listen in its own right. Ask your abstract electronic music specialist if SUBVARITRAX™ is right for you. 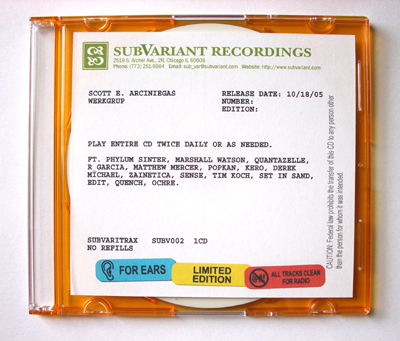 The “prescription only” form is a limited-edition release that includes a CD in a transparent orange jewel case with a label featuring the “patient”’s name (i.e. any name or message you choose) and dosage instructions on the front. This is placed inside a white, pharmacy-type paper bag, and sheets of “additional medication info” are folded and stapled to the top of the bag–remarkably similar to American pharmacy packaging. Sparkling streams of glistening melodies unfurl throughout Phylum Sinter’s (Detroit-based Christopher Todd) “Monastic Phase,” Sense’s (Melbourne musician Adam Raisbeck) “Gift,” and Ochre’s (Chris Leary) buoyant epilogue “Copacetia” while boisterous breaks splatter and flail in tracks by Marshall Watson and Quench (aka Funckarma, Netherlands-based Don and Roel Funcken). edIT’s (Ed Ma, Planet-Mu) fabulous stutter-crunk oasis “Spare Spork” is an album highlight, as is … [the] Quantazelle cut “Late Blazing Kinch Theme,” an entrancing intertwine of scurrying percolations and harp melodies. On the techno front, Frederique Garvin drops twitchy, bass-throbbing machine-funk in “Not So Hot,” Derek Michael coaxes whirrs and groans from his gear in “Similak Jiggles,” and Matthew Mercer and Detroit Underground label head Kero (Sohail Azad) take schaffel strolls in their respective outings. While R_Garcia’s gleefully stomping, arcade-flavoured “Honkeywrench” impresses too, the album’s peak arrives with Popkan’s (Tom Erdmann) “Broken Lighter,” a tasty sampling of funky, M-Nus-styled minimal house. While Erdmann’s micro-sampled field of blips, smears, and croaks sounds incredible, it’s the little kick he adds to the tail end of the warping bass line that’s pure genius. A terrific outing by the Chicago-based subVariant imprint, the ‘instrumental neuro-stimulant’ Subvaritrax™ more than makes good on its promise to treat Sonic Mediocrity Overexposure (SMO) with a therapeutically forward-thinking mix of melodic IDM and glitchy minimal techno.” -Ron Schepper, TEXTURA. “Phylum Sinter’s “Monastic Phase” starts the gentle release into your bloodstream with tender melodies drifting in a free-form solution of squishy beats and rain-kissed tones. Marshall Watson recommends a “Fall Without Change,” a gravity-free undulation of synthesizer and frayed beats that moves like a heat wave across still landscapes. Label-owner Liz McLean Knight who records as Quantazelle (as well as being the creative force behind the jewelry line Zelle and attendant online shop, Fractalspin.com) slips us a dose of “Late Blazing Kinch Theme,” a vaguely Aphex Twin rhythm scattered across harp melodies and subdermal beat dappling. It’ll hitch in your throat and leave a resonating hum that will percolate through your brain for days. She also offers “Braking (Hushed),” a gurgling lurching tune that sounds like electric wind chimes being shaken by a low magnitude earthquake. Nothing traumatic, just chaotic movement given sound. Randy Garcia’s “Honkeywrench” keeps catching my ear as it dances and jabbers about. Anchored by the spitting sound of speaker feedback from local RF signals (and I get it enough at the day job that I keep thinking that this track is just fucked up and not cleverly recycling modern noise detritus), R_Garcia throws up squiggling pong melodies that flit about with joyous abandon. There’s a middle of the Subvaritrax dose that goes all woozy on you with house rhythms skewed with jittery noises and squelchy bursts of liquid funk as Matthew Mercer, Popkan, Kero and Derek Michael ooze into your system. Tim Koch’s “Minor Rendered” puddles with aquatic dub while ringing with minor chords that are flung up like fireworks to hang in the sky. A sinuous funk beat slithers into the room and coils around our ankles, lending a lurching stagger to our dance steps. While Zainetica delivers a swooping aerial ride filled with the guttering echoes of synthesized voices in “Bytesize,” Sense’s “Gift” is a orchestral wash of electronic tones and fluffy melodies. As Set in Sand’s “A Echo of An Mistake” (sic) warbles and threatens to lose track of its rhythmic center (yet retains it in the end as the effort is to shift you slightly and not yank the chair out from beneath you), edIT’s “Spare Spork” shares no such illusions. The beats in “Spare Spork” stab at you with their guttering intensity, echoing in the background like ping pong balls ricocheting off concrete walls. The lonesome guitar melody in the foreground is dragged in the wake of the beats, its melancholy secondary to the gutter-jerk of the affected beats. Quench keeps some of the manic energy afforded by edIT (this is the end of the dosage after all, somnambulant effects must be wiped away) but channels it as BPMs. Shivering beats collapse and percolate like hot water in a coffee maker while digital melodies churn and curl around one another like snakes, like Mobius patterns. 2CheckOut.com Inc. (Ohio, USA) is an authorized retailer for goods and services provided by Initialize Media, LLC. © 2004 subVariant recordings. All rights reserved.